This film is an absolute paradox. It feels like it was made in a different era – a more optimistic, less cynical era. For a start, the film has an almost brutally naïve faith in truth and honesty winning the day, and seems to revel in its own ridiculousness. The narrative begins in a realistic place and spirals into a hyper-patriotic unreality; a world in which an everyday American can become a hero by taking the lead in an incredibly high-stakes situation (Die Hard anyone?). But at the same time, the film feels like a direct result of the current political atmosphere; where government transparency is hotly debated issue, and the line between being a whistleblower and a traitor is more obscure than ever. The film even references WikiLeaks, and shows one character trying to use social media to cut through a media storm with those pixilated camera phone images we have become accustomed to seeing on the nightly news. Watching the film try to include some semblance of realism as it descends into a camp action film is possibly more of a spectacle than the actual set-pieces. Our hero is John Cale (Channing Tatum), a single-parent, police officer and full-time underdog gunning for a job with the Secret Service to impress his daughter, Emily (Joey King), who has an unusually mature interest in politics. When Cale doesn’t get the job, he lets Emily talk him into tagging along on a guided tour of the White House, but when a bomb goes off – destroying the iconic dome and instigating mass panic – the two are separated, with Emily taken hostage. From this point on, the film tries to be a buddy comedy film, with Jamie Foxx as the President and Channing Tatum trading quips and one-liners, and a serious, unrelenting action film. Granted, Jamie Foxx and Channing Tatum have great chemistry, but every time they crack jokes it feels wildly inappropriate, considering the direness of their situation. 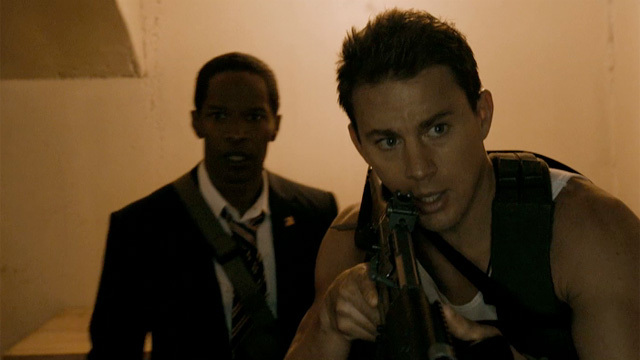 White House Down is tonally all over the shop, and as it gets less realistic, the stakes evaporate and it becomes a marvel of explosions. Now, I’m not here to say that watching explosions isn’t a valid use of your time. If that’s one of your prerequisites for a good time, then White House Down is the film for you. The film is an amalgamation of every “American hero prevails in time of national distress” film that you’ve ever seen, complete with flag-waving, a bombastic and triumphant score, a helpless mother figure and just enough comedy to avoid inducing trauma in its PG-13 target audience. The film is formulaic and trades in likeable, familiar stereotypes. Hell, even the villains would be likeable rogues if it wasn’t for their penchant for destruction of property, assassination and cyber-crime. And, though I am slightly surprised at myself for saying it, the film is fun. Unfortunately, I feel like anything else I would have to say isn’t worth reading. You’re either game for the film’s cinematic excess, or you’re not.